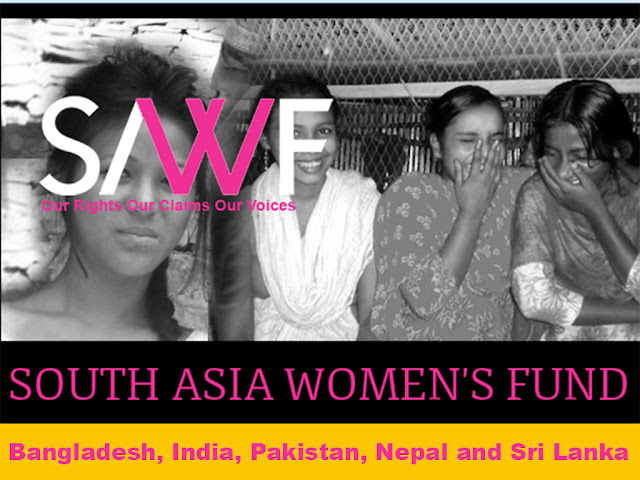 NON-FCRA PROJECT: SOUTH ASIA WOMEN’S FUND: SMALL GRANTS PROGRAMME! SAWF’s Small Grants Programme is aimed at supporting women’s groups and activists, especially those working at the grassroots, to undertake innovative, cutting edge and critical work. Apart from supporting specific initiatives/programmes, the SGP also supports participation of activists in critical spaces, training programmes and workshops through small travel grants. The maximum limit of the grant amount is 5000 USD per organization/individual, and needs to be utilized within a year. - Implementation of new, out of the box ideas mooted by young feminists and second line leadership of an organization to enrich the work of the group/organization they are with, to expand, strengthen and/or enhance women’s realization of their human rights. - Innovative initiatives that have the cutting edge potential of being up-scaled. - A specific component of a planned programme for which additional resources are needed, building on an unexpected outcome/spin offs of previous initiatives. - Responding to an unexpected critical need/demand of women communities. - Undertaking a pilot project, baseline research, public event or a needed publication that can address future needs. - Addressing immediate learning needs. - Any other activity that will fit into SAWF’s criteria, and will be approved by the Advisors to this grant.